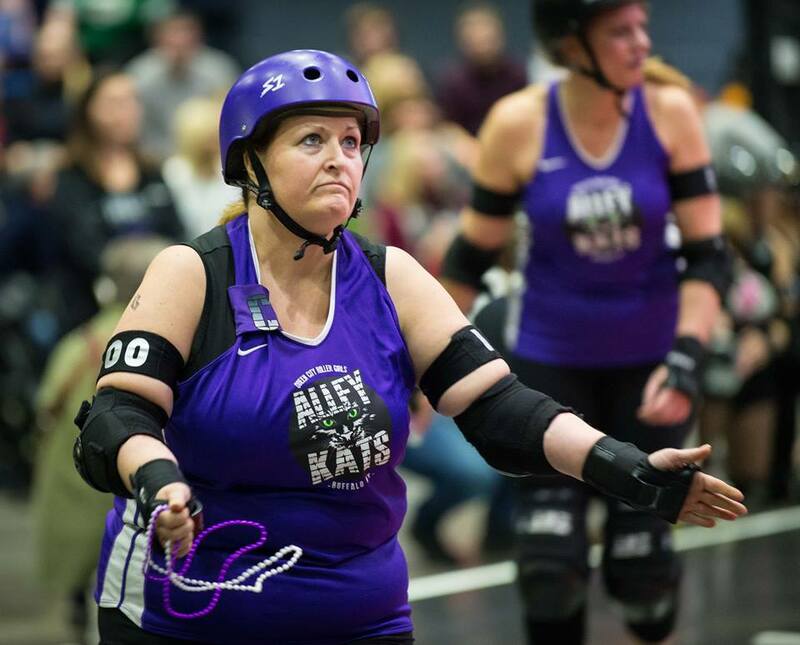 This month’s featured skater is the captain of the Alley Kats, Flocking Girl Scout. Her league mates affectionately call her Figs for short. Figs has been a member of the Alley Kats since 2011. 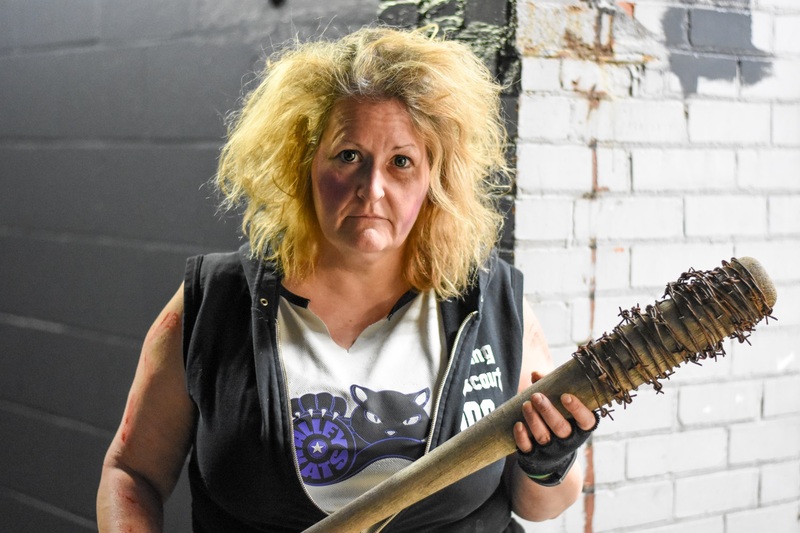 She is an experienced blocker who not only has witnessed the evolution of the sport of roller derby, but has guided the Alley Kats from a team who lost all of their games, to a serious competitive team to be reckoned with. Figs’ leadership is the glue that has kept the Alley Kats together, and she has done this with her own unique sense of humour. I used to take my Girl Scout troop roller skating at Rainbow Rink and league practice happened after we were done. I honestly thought their outfits were cute, so I inquired. So dumb, isn’t it? It’s true! Was it the fishnets, the shorts, or the socks? It was the socks. I joined the league because I liked their socks. We needed to raise money for my Girl Scout troop to go to Australia. I researched how to fundraise. We couldn’t sell cookies, because you only get 50 cents a box. It had to make us some money. So I found flamingo flocking on the internet. You go in the middle of the night and you put 25 flamingos in someone’s yard, and you leave a little note. It says that they can donate money to the girls. So we did this all summer and we raised $4500. We did four houses every night. We hung a little sign on people’s doors. These girls still don’t know that they would probably be the best house robbers in the world! People would call and tell us that we could take the birds out. They could pay $5 to have us do it to each of their relatives, and they did. Every night for this whole summer we were out moving four flocks of birds to other houses. So when I joined derby, I needed a derby name! I asked the girls to help me. They thought I should be named Mother Flocker. But I thought their parents would not enjoy them coming to watch me and saying, “Go Mother Flocker!” So I changed it to Flocking Girl Scout. What is your favourite flavour of Girl Scout cookie? Definitely shortbread. It always has been. I will eat a thin mint, but I put peanut butter on the back. You have been involved with roller derby for a long time. What has it been like being part of the sport’s evolution? There’s been so many rule changes. There used to be two whistles. One to release the blockers, and once the last blocker passed the pivot line, then the second whistle blew and the jammers went. We also played with the minute-long penalties. The year I was in Queen’s Court, I ran the light board for the NSOs. It was like a sandwich sign, and it had Christmas tree lights on it. Skaters could get either three or four minor penalties – see, it’s so long I can’t remember! Once they got their last minor, they would get another penalty that would turn the light bulb red, and they had go sit down for a full minute. Do you think the rules have improved the sport? Definitely. It’s made it a lot safer. How was your experience in boot camp? Because I loved the socks, I never saw roller derby played! I never even watched it when I was a kid in the 70s. To do boot camp, it was $80 to join. It was August. It was so gruellingly hot. There were big huge industrial fans in Rainbow Rink trying to cool us off and we were still dripping with sweat. We were totally soaking wet. I didn’t even know that I needed gear. I thought I would be able to rent stuff. I showed up on the Sunday morning, 20 minutes before it started, because I had no idea. They told me that I could rent skates, but you need all of these pads. Something happened where I didn’t get the proper emails, so I didn’t know. [Skater name withheld] saw me and she let me use her gear because she was there to volunteer. She told me that once I figure out how to put all of my gear on and put my skates on to come in the bathroom because she wanted to tell me something. I said okay, I don’t know this strange person! I was intimidated at the time. I think it was the tattoos. As soon as I got around the corner into the bathroom, she shoved her mouth guard in my mouth. She said, “I’ve been running it under the hot water while you were putting my gear on, but they’re not going to let you skate unless you have one.” I’m like, “I don’t even know your name, and I have your mouth in my mouth!” I hadn’t been on skates other than with my Girl Scouts fooling around. Or when I grew up my mom would dump us at the rink every Saturday and I would skate, and that was it. I cried in my car after the first day, and I said “What the hell did I just do?” But I told my kids once you sign up and you start something, you have to do it! I thought, it’s just four weeks. I can do four weeks! The Alley Kats have gone from losing all of their games to being one of the strongest contenders in the league. What has this journey been like you and for the Kats? Extremely hard. The first year I was drafted, the coaches were a husband and wife. She was a skater, and he was the coach. We pretty much did what they said. They were good coaches for that type of derby, and then they both stopped, and then we tried to have an ex-skater be a coach. Then we lost half the vets. These were all the vets that were the original Kats when they first started the team. We were the fourth team added to the league. The experienced skaters were gone, and we were pretty much all rookies. So the team was in chaos. We got beat for a few years. The score would be like 300 to 25 or 50. I don’t think we ever broke 100 points. We just wanted to have fun. But we knew we needed someone to coach and that’s when we asked Shock-Her because we learned he was retiring from the Herd. What do you like about Shock as a coach? What challenges have you faced as captain of the Alley Kats? There’s a lot of personalities that you have to learn and be able to control when they need to be controlled. When issues arise, it’s difficult. I’m older than everyone pretty much. I’m the oldest on the team. Yunita is three days younger than me. It’s a struggle because I’m a different generation than what’s on the Kats now. We have to learn how everybody works together. What goals do you have for the 2017 Alley Kats? Our goal was to be 4-0. We came pretty close to that. The goal is to take the QCRG cup home. 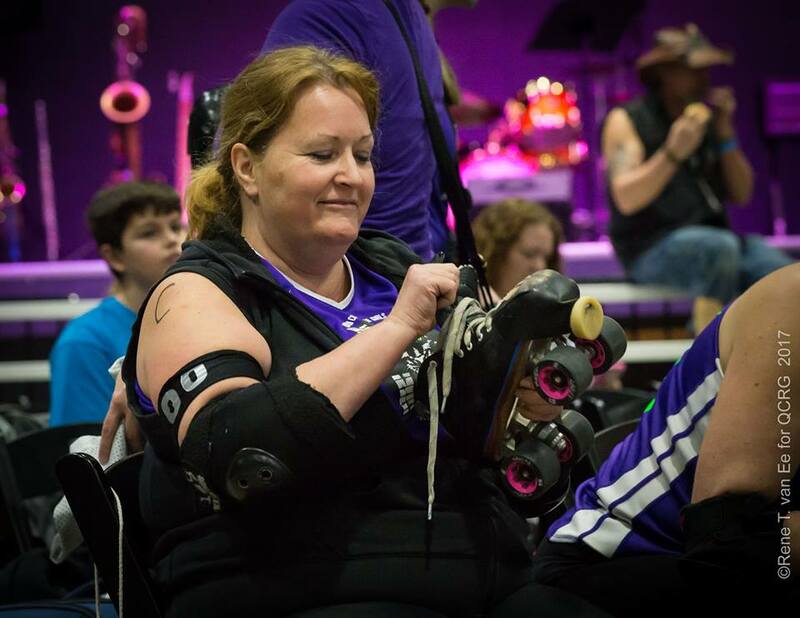 What advice would you give to someone starting our roller derby? Put in as much time as you can. But don’t burn yourself out with too much time. And just have fun. Don’t forget to have fun! Next Article Furies move up to 18th in WFTDA Rankings!